Why are we floating about looking at dead seaweed? Because it’s NOT seaweed! These little beauties are robust ghost pipefish (Solenostomus cyanopterus) and despite their name they are NOT particularly robust and are often overlooked. They are also NOT even ‘true’ pipefish but more of a cousin! Everything we told you about them so far was wrong! Sorry. So what DO we know? Well ghost pipefish are monogamous, this photo is of a male and female pair (awwwwww true love). The female is the larger, paler pipefish and easier to spot from the enlarged, fused pelvic fin forming a brood pouch. This pouch is for incubating fertilised eggs, in ‘true’ pipefish and seahorses (Syngnathidae) it is the male that broods the young. 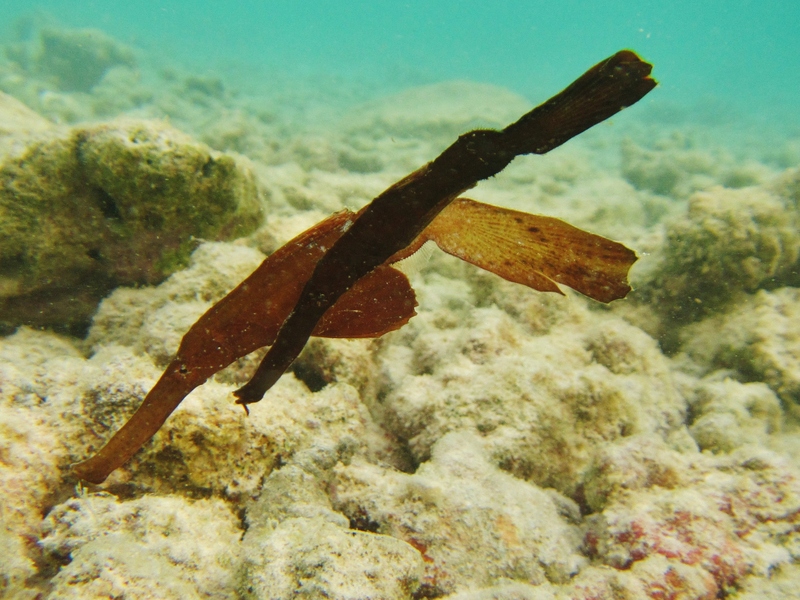 Ghost pipefish get carried by the surf, floating around in a characteristic head-down position, mimicking a piece of dead seaweed to avoid detection. They take this position because they are ambush predators. An unlikely animal to think of in an ambush situation but their long head (44% of their body) gives them plenty of suction to glup down any unsuspecting invertebrates swimming past. But by far the BEST thing about ghost pipefish is that they can move their eyes in completely different directions! Moving either simultaneously or separately, enabling them to effectively scan the ocean floor for prey.